Plans at currently at an advanced stage to host a national Be Wise at Height Seminar in partnership with the Health and Safety Authority and a number of industry experts. 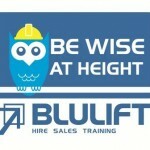 The event organised by Blulift’s Training Manager Pat Brown will be hosted in Limerick. Full details will be announced in coming weeks.